ProofSafe for Arborists - Collect tree data and manage safety on your phone. What is the Tree Protection Zone or Root Protection Area? The TPZ or RPA is a designated area around a tree that is protected when nearby works are being undertaken to preserve the soil and tree. The area is usually calculated by multiplying the DBH (trunk diameter at a given height) by 12, e.g. if the DBH is 50cm then the TPZ will usually be 6m radius measured from the centre of the trunk. This shouldn't be a set rule, each tree is different and the context is very important; A large old tree is not as tolerant as a young resilient specimen, and therefore the TPZ should be adjusted out to provide additional protection. 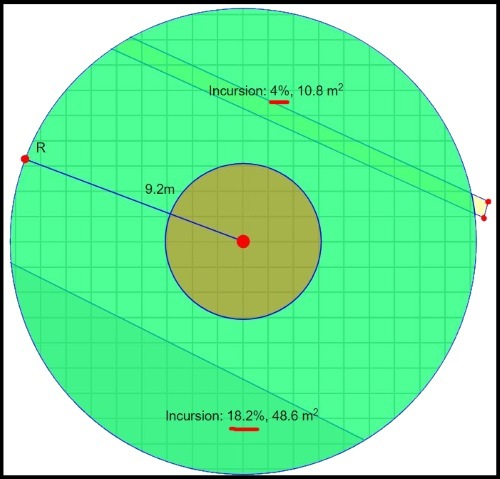 Drag the radius BLUE dot (R) to set the size of the green TPZ circle, then drag the 'buildings' over the TPZ to calculate the percentage of encroachment. The two numbers displayed within each building are the percentage of encroachment into the TPZ and the area encroached. You can change the shape of each building by dragging the red dots. Drag and extend the blue ruler to set or measure distances. Using the red dots around the TPZ circle the TPZ / RPA can be changed to a polygon, this might be used to provide area calculations for sites where it is known that the root map is not circular, for example where previous trenching has occurred or a road built adjacent to the tree. Use the Blue dot to reset back to a circle. If you're working with a small TPZ you can zoom in on your web browser screen by holding Ctrl and pressing + or scrolling your mouse, once zoomed in you can more precisely set the TPZ size and building locations. The Structural Root Zone or Critical Root Zone (CRZ) is an area (radius) around a tree trunk that must be protected to ensure stability of the tree in the ground. If larger roots within this area are damaged it is highly likely the tree's structure will be compromised, possibly causing whole tree failure. The SRZ primarily relates to structure as opposed to tree health, to protect tree health The TPZ should be adhered to. In the Australian Standard 4970-2009 the SRZ is calculated based on a measurement of trunk caliper taken just above the root buttress, this TPZ calculator assumes SRZ caliper as: the measured Diameter at Breast Height (DBH) plus 10%. When both buildings are used, and they overlap, then that area of overlap that sits within the TPZ is calculated and displayed. A calculation of overlapping buildings is useful when a proposed development sits partially or fully within the footprint of a pre-existing structure on site. There are many factors that contribute to the impacts of development on trees such as building methods, tree species, soils, water catchment area and tree age however if an existing structure near a tree, predated that tree, then it is likely the distribution or density of roots below that structure will be less than the roots in nearby areas such as open lawns and garden beds. In a situation where a proposed footprint overlaps that of a pre-existing building, a major encroachment may not significantly damage the tree. Tree Protection Zone and encroachment calculations provide an excellent guide for working near trees however root distribution and density is rarely uniform and therefore non destructive root mapping may provide valuable insights around likely impacts. The best approach if at all possible is to keep development well away from trees - outside the TPZ. The less incursion and less disruption to normal tree function (above and below ground) the happier trees will be and the more likely development plans will be passed at council. Keep in mind that any cut across a Tree Protection Zone such as a trench is highly likely to sever all roots that radiate out beyond that trench. Ensure that so far as possible all excavation including trenches are avoided near trees, and when using the calculator cover the entire 'lost' area to get a truer indication of percentage encroachment. The Australian Standard AS 4970-2009 Provides detailed information on how to apply these types of calculations and the various considerations.